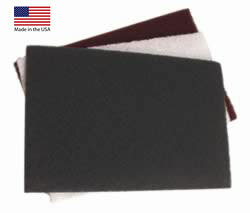 These 6" x 9-1/2" hand pads are great for smoothing between coats of finish, applying waxes or cleaning metal surfaces. They perform much like steel wool, but are much more durable. The Hand Pads can also be used in place of sandpaper on an orbital finish sander, when working on large surfaces. Non-Woven pads are washable, non-loading and conform to almost any surface. These pads come in medium, fine and very fine for a wide range of finishing tasks.